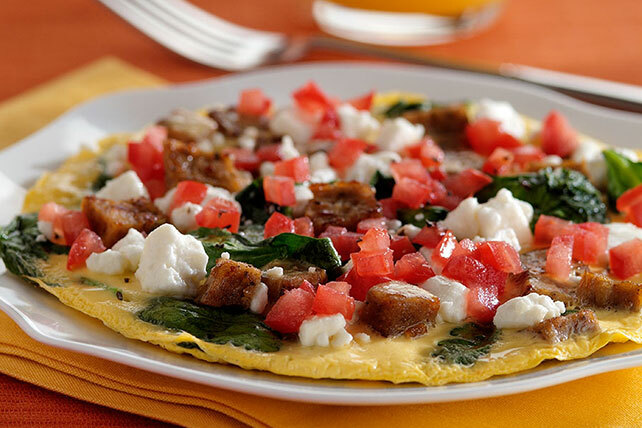 Cool tomatoes balance the warm omelet made with veggie breakfast links and spinach in this wake-up breakfast dish. A sprinkle of feta cheese tops it off. Cook link pieces in nonstick skillet on medium heat 5 min., stirring occasionally and adding spinach for the last minute. Stir in egg product; cover. Cook 3 to 5 min. or until egg product is set. Sprinkle with cheese. Remove from heat; let stand, covered, 2 min. or until cheese is melted. Top with tomatoes and pepper. Substitute 1 beaten egg for the egg product. Prepare as directed, using a medium nonstick skillet and doubling all ingredients. Cut in half to serve. Makes 2 servings.